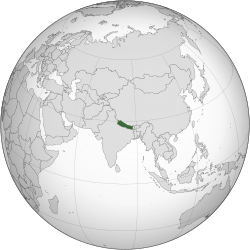 राष्ट्रगीतम्: "सयौ थुङ्गा फ़ूलका हामी"
↑ ३.० ३.१ ३.२ ३.३ "Nepal". International Monetary Fund. Retrieved 21 April 2011. ↑ "Human Development Report 2011. Human development index trends: Table G". The United Nations. Retrieved 5 November 2011.